18 Oct 2018 --- Boosted by growing consumer demand for natural remedies to fight the daily stresses of modern life, the adaptogenic herb ashwagandha is seeing an impressive uptake in usage. Innova Market Insights data has shown an increase of 48 percent in the number of food and beverage launches globally in 2018 (year to date) relative to 2015, and the adaptogenic herb’s market potential has not gone unnoticed by suppliers, with both Arjuna Natural and Sabinsa announcing the launch of ashwagandha ingredients this autumn. to Innova Market Insights data. 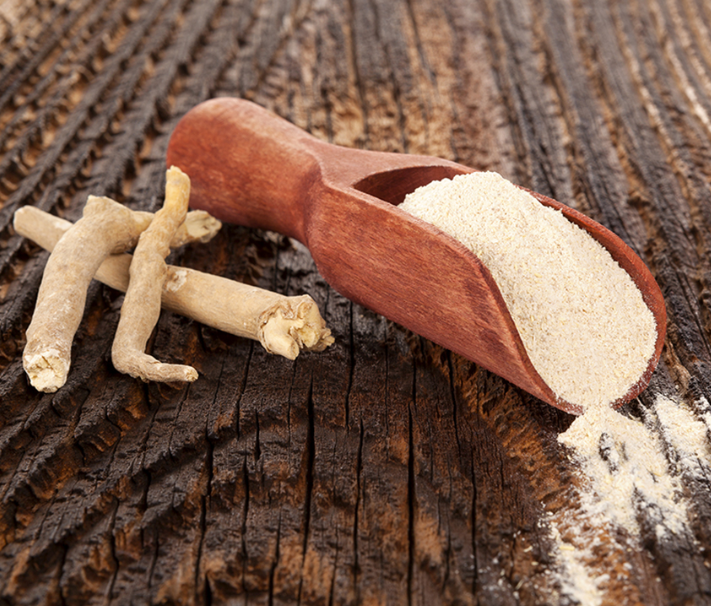 The US leads in the commercial application of ashwagandha in food & beverage launches. 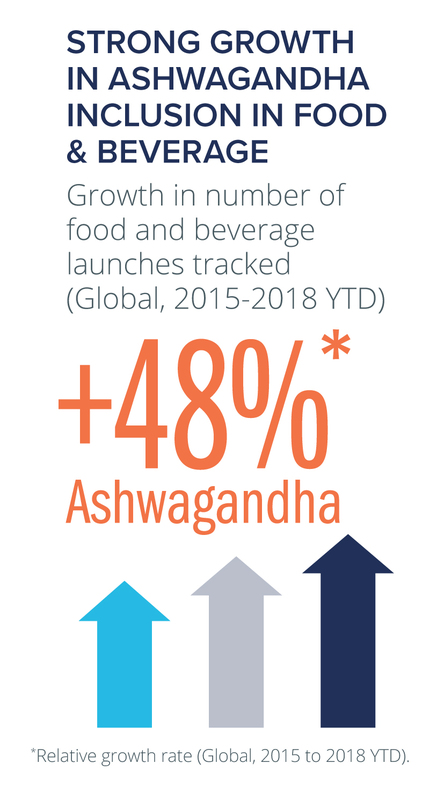 In fact, Innova Market Insights reports that the number of food and beverage launches tracked in the US is 3 times higher than those reported in India (2015-2018 YTD), ashwagandha’s country of origin. Ashwagandha is an Ayurvedic herb traditionally used to counter the reactions of stress by reducing the amount of cortisol released in the body. The Ayurvedic herb, which has been used for centuries is experiencing worldwide growth thanks to a growing body of clinical evidence. Ashwagandha opposes the reactions of stress by reducing the amount of cortisol released, reduces the formation of stress-induced ulcers, boosts sleep, and, notably, increases the number of immune cells which aid in fighting infections. In a recent report, NutritionInsight explored the adaptogens space, with suppliers noting that ashwagandha has found application in various delivery forms including chocolates, chewing gum, nutritional bars, soft chews, gummy bears, juices, RTD beverages, coffee, tea and granola. Sports nutrition is the leading category for the ingredient, Innova Market Insights further notes, with one in three product launches tracked globally between 2015 and 2018 belonging to this category. A further two in five launches featured an energy or alertness claim. At Hi Europe 2018, Arjuna Natural is to feature Shoden, an all-natural extract of ashwagandha (Withania somnifera). Shoden contains ashwagandha extract standardized with 35 percent withanolide glycosides, a highly active component of ashwagandha. Arjuna reports that Shoden is manufactured from carefully selected ashwagandha roots and leaves. Toxins are removed from the roots and leaves using a proprietary detoxification process that also removes other undesirable components and maintains withanolide glycosides at optimum levels. Arjuna developed its Bioactive Ingredient Protection System (BIPS) proprietary safety technology to ensure optimal delivery of the bioactive components of ashwagandha. BIPS is a patented procedure in which all the active molecules are encapsulated in a shield to deliver them safely and at the desired potency, reportedly making Shoden active, even at a low dosage. Several ongoing clinical studies of Shoden are already yielding promising results for alleviating depression, stress and sleep disturbances and for improving immunomodulation and the production of testosterone, the company reports. launch of ashwagandha ingredients this autumn. “Adaptogens like ashwagandha are very well established in tradition and science and offer a broad range of health benefits. Ashwagandha has the market advantage of strong advocacy from other purveyors, while other adaptogens like schisandra and rhodiola lag, with no major company pushing those forward,” claims Kartikeya Baldwa, CEO at Ixoreal. As interest in ashwagandha heats up, so will the challenges to supply the market with scientific, traceable supply. “As more and more manufacturers adopt adaptogenic herbs, there is also the fear that dubious supply of these ingredients may creep into the marketplace. While sourcing an adaptogenic ingredient, manufacturers need to be vigilant about factors like proper botanical identification, purity, third-party quality certifications, good manufacturing practices, supply chain transparency and scientific corroboration,” Baldwa notes. “To appeal to consumers, firms need to present scientific research and evidence in a manner that is easy to understand and not too complicated. Therefore, investment is required in conducting high-quality research,” she adds. Continued studies should focus on stress, enhanced mental acuity, sleep improvement in overall quality of life and happiness, Baldwa notes, adding that these should be accompanied by highly visible marketing efforts highlighting tradition and origins. “A strong, prominent, well-rounded presentation of all of these is required for continued success and growth,” Baldwa concludes. For more than a quarter of a century Arjuna Natural Ltd. has been India’s leading manufacturer of standardized spice and botanical extracts for dietary supplement and food and beverage industries. Established in 1992, the company has grown rapidly, with customers in 50 countries. The company has an R&D tie up with international universities from Australia, US and Japan. Arjuna’s production processes and products meet market-specific regulations worldwide. With a total manufacturing area of 400,000 sq.ft. its four manufacturing facilities for herbal extracts meet all international standards. Arjuna, an ISO22000:2005 company is a GMP certified, SAP driven company with Kosher and Halal certification. Arjuna has over 75 international patents to its credit and of which majority are commercialized globally. The highly advanced R&D unit at Arjuna is a complete research facility for phytochemistry, pharmacokinetics, formulation and development, pre-clinical and clinical studies. The state-of the-art laboratory at Arjuna has been approved for in-house research by the Ministry of Science and Technology and the Government of India since 2002. Arjuna believes in initiating actions that emphasis on creating an environment that supports minimal ecological footprints. Achieved through pro-active employee engagement programs, a sustainable workforce culture is what steers the green initiative agenda of the organization. Oxystorm® is an extract of Amaranthus one of the highest dietary sources of nitrates discovered. Oxystorm® helps in boosting Nitric oxide, the essential molecule that aids various integral functions in human body.Trilow®- Full spectrum Indian Gooseberry extract (Amla) for optimum heart health. Trilow® – Full spectrum Indian Gooseberry extract (Amla) for optimum heart health. 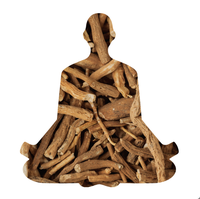 Shoden® contains an Ashwagandha Extract standardised to 35% Withanolide Glycosides (the bioactive component). This is by far the highest composition compared to other extracts on the market.